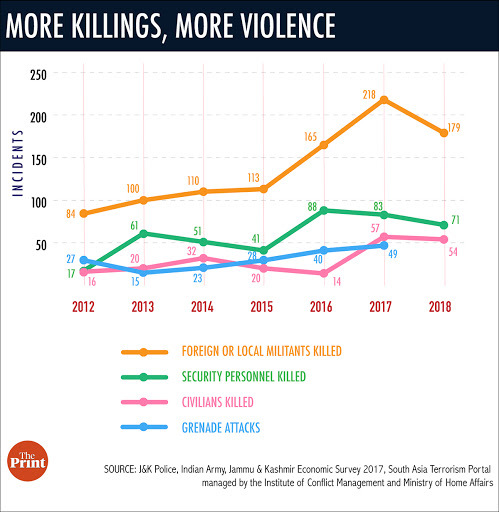 Since the Narendra Modi-led BJP came to power at the Centre in 2014, Kashmir has witnessed more violence, deaths and alienation of the masses. New Delhi: Last month, Firdousa was at home in Shadimarg village in south Kashmir, awaiting the birth of her third child, which was due in about three months. Now, Firdousa and her unborn child lie buried in a nearby graveyard, leaving behind a grieving husband and two distraught children. 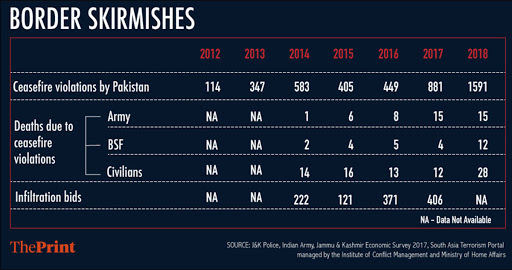 The growing trend of grenade attacks in the Valley has risen from 27 in 2012 to 49 in 2017. A day before the panchayat polls, Hizbul Mujahideen released a chilling video – the first of its kind – showing militants killing a youth they believed was an Army informer. The video, which has gone viral, showed militants pumping several rounds of bullets into Nadeem Manzoor of Pulwama. His body was recovered Friday morning. The killing has been widely condemned and the video has been compared to ‘ISIS -style” on social media. Former chief minister Omar Abdullah called it “cold blooded murder”. Another teenager was killed brutally on polling day on Saturday. Militants had abducted three civilians in the morning and one of them identified as Huzaif, a baker, was killed with his throat slit. Party chief Omar Abdullah also blamed the now-defunct PDP-BJP alliance, and said the country needs to question Prime Minister Narendra Modi for mishandling the state. This report has been updated 18 November with the viral video of killing of a teenager. Mr Modi came with an image of being heavily anti-Muslim, rightly or wrongly because of Gujarat, and he did nothing to correct that perception. As an individual he was not obliged to, but as the prime minister of a secular country, he was expected to. 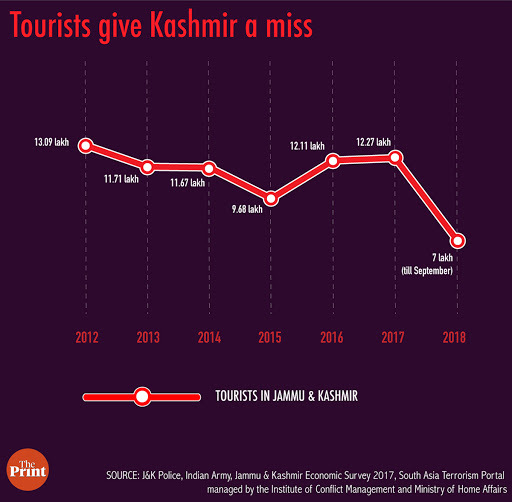 That is at the bottom of increase in Entropy or restlessness in Kashmir. It may be his arrogance, or lack of imagination or both, the truth of the matter is that he has not the foggiest idea of how to go about the problem of Kashmir. 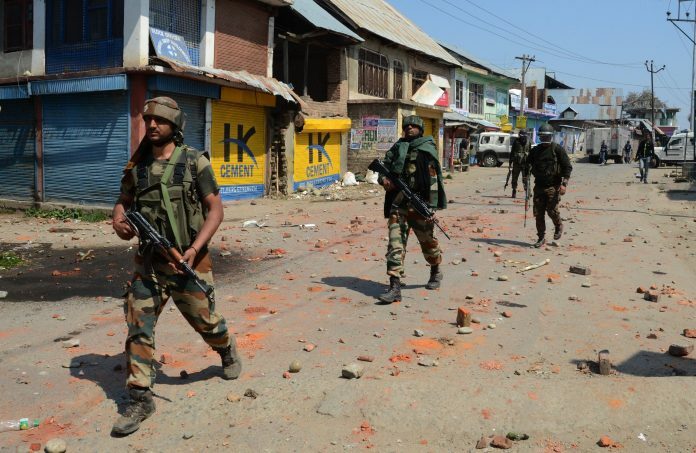 Kashmiri people are weak, Pakistan is weak, Modi is in a strong position, but instead of stepping forward like a strong man and calling out to weak people to pep them up and encourage and assuage them and create an atmosphere for positive talks conducive for peace, he has disconnected his telephone lines and is hiding behind a strong army. Who will call him a strong leader? Or even a leader, to begin with, seeping his other haphazard actions? This is a very detailed article and the author must be congratulated for it. It has all the rigors of academic research, with graphs etc, and perhaps is a part of her M.Phil thesis or something like that! But as for the Kashmir problem itself, I get an eerie feeling that it is only TWO STEPS away from spinning completely out of India’s control. Whose mistake congres bjp people of kashmir valley or pakistan whose mistake??????????????????????????????????????????????????? reporter technically vichar kare.